Discussion in 'Houston Rockets: Game Action & Roster Moves' started by Shaq2Yao, Jan 11, 2019. BigMaloe, Killatron 2000, Richie_Rich and 2 others like this. BigMaloe, cbs1507, BigShasta and 1 other person like this. It's CLEAR the Rockets/Harden want the streak to grow.... and I aint mad. It is risky having him playing during garbage-time and it won't help his late-season stamina, but I hope everything works out despite logic. This is History in the making, and increases Harden's legacy and MVP chances. BigMaloe, don grahamleone, chadyang and 4 others like this. You say that, but once again tonight he didn't really try for it until the end. He came back in the 4th with the Mavs closing the gap, took one 3 and then after that the next two possessions he acted as a decoy and a passer. Then he decided to go for it. BigMaloe, Blurr#7, BamBam and 8 others like this. BigMaloe, don grahamleone, samtaylor and 4 others like this. I just popped in to find tonight's DaDakota post saying Harden doesn't care about winning and only cares about stats. Deuce, BigMaloe, don grahamleone and 3 others like this. BigMaloe, don grahamleone, RocketRoller and 8 others like this. 20-10 is our record during the streak, not great, but not bad either. chadyang and hakeem94 like this. 67% winning percentage. Meh, that'll do. BigMaloe, don grahamleone, topfive and 2 others like this. don grahamleone and BigShasta like this. Tied for 2nd most wins in the NBA. And with all those injuries, too. There is no other way except to call it amazing. Deuce, BigMaloe, BaselineFade and 15 others like this. LOL... Mavs weren't closing any gap. They were down 14 beginning the 4th then Harden re-entered 7:00 min up 16. He wasn't gonna exit the game until he got 30 or time expired. That Dreamshake dude tried to call-out Morey, prematurely calling Harden's streak would be snapped. BigMaloe, BaselineFade, don grahamleone and 17 others like this. 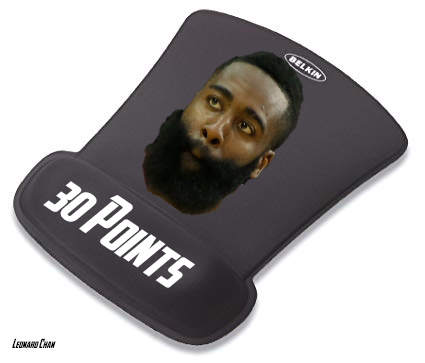 Harden didn’t seem all that interested in it for most of the game. Also Harden and Paul have this weird thing where they want to finish games. Harden has said before not all game minutes are the same, there are really hard minutes and easy minutes. Deuce, BigMaloe, don grahamleone and 2 others like this. CP3 also mentioned tonight being surprised that Harden passed up opportunities to take the ball to try to go for 30 and that he (CP3) was kind of more interested in getting it for him. BigMaloe, BaselineFade, don grahamleone and 4 others like this. I'll take 2 out of 3 in the playoffs. Why are you so damned determined to sh!t all over Harden's amazing statistical year? Do you really think we'd have a better record if he was averaging 27 ppg this year? Are you THAT crazy?? Do you actually watch the games? BigMaloe, don grahamleone, jcf and 5 others like this. Go crawl in a hole. How many of those games has Paul missed? How many has Capela missed? What was our record before he went on his streak? How many of those 30 games would we have won without him? Maybe 3 or 4? You and another poster in this thread need to get off his back. It has ranged from him being fat, to him being lazy to “sticky ball” to any other excuse to not acknowledge what he has done. You have spent over half a decade criticizing a guy that has improved every season and has a chance to set the modern record for scoring in a season all while being historically efficient. freckleslol, slothy420, Deuce and 7 others like this. James Harden Full Highlights 2019 WCR1 Game 1 Rockets vs Jazz - 29 Points 10 Assists 8 Rebounds! James Harden Highlights Rockets vs Nuggets 2019.03.28 - 38 Points, 6 Rebounds, 6 Assists! TOO GOOD! James Harden First Player to Have At Least 60 Points and 9 Three Pointers In A Game! James Harden You Are RIDICULOUS! 61 Points, 7 Rebs, 3 Steals, 9 3PTs!